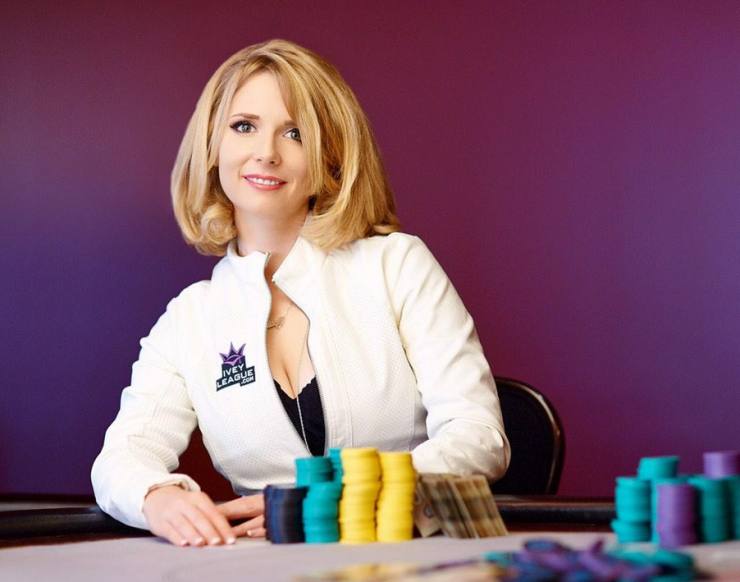 Gillian Epp is a high stakes poker player, as well as a tournament host and author. She took to the tables initially as a dealer in a local casino, but soon realized that there was more money to be made actually playing the game. She quit her job and began playing poker, first online and then at live poker games. Since then she has traveled the world, playing cash games against the top poker pros. She is one of Canada’s most recognizable female poker players. We had the opportunity to talk to Gillian and in our poker interview we asked her 20 questions about her poker career and what it’s like to play high stakes poker, both as a Canadian poker player and as a female player. 1) How did you get started playing poker? I’ve always loved playing games: Card games, board games, sports. If you invite me to play a game, I’m always in. I got into Hold’em specifically while traveling through India. I was in India practicing yoga, and because yoga practice was during the wee hours of the morning, it left lots of yogi travelers sitting around with nothing to do. A poker game broke out in the hostel, and I always participated. 2) What did you do to improve your poker skills? After traveling through India, South East Asia and China, I returned to Canada, where I took a job as a dealer at a local casino. This provided some more insight into the game. 3) You supported yourself as a poker dealer. How did you get the job, and do you have any amusing anecdotes from your experiences? I really enjoyed dealing. I simply applied for the job and was accepted. I then attended dealer school at the casino for a week. Looking back, I realize how little I knew about poker at the time, but it was my introduction to the world of professional poker players. 4) As a dealer who was also an avid player, did you ever find yourself trying to read the minds of the players at your table? Dealing can be very tedious if the players aren't entertaining you. But that down time is a great opportunity to learn and study hands and players. If I wasn’t chatting with the players then I was defiantly analyzing what was happening in the game. 5) When you started playing poker, where was your greater success – online or live? The first time I played online I deposited $200. I lost $100 very quickly and then used my entire remaining bankroll to play in 1 one-hundred dollar MTT. I came 2nd, and thought I was really good… I wasn’t. I enjoy the social part of poker, and also feel I have a great advantage playing live. So I’m definitely a live player. 6) Without being able to actually see their opponents in real life, what strategies should online poker players employ to succeed at the virtual table? Even online there are tells. Search the player and see how many tables they are playing, also Google their screen name to find out who they are, and create a mental image of them. Timing tells, even after all the talk about them, are still very useful. Also, watch for players that use the Auto buttons. If you find a player who uses them, you can min raise whenever you have position, giving you a greater read on his range. 7) Which do you prefer, cash games or tournaments? I don’t like tournaments at all, unless I’m in the money and deep. I’m not a very good loser, and the fact that you lose so often in tournaments, I struggle with mentally. I also got into professional poker because of the freedom it allowed me. The ability to play, quit, and do whatever I want. In tournaments you are forced to follow their schedule. 8) Have you had poker tournament success? If so, what was your best finish? I only play about 7 live tournaments a year, which really isn’t enough, but the first CPT I ever played I won, after being down to 2 BB, 4-handed. 9) You are listed as a high stakes poker player. What are high stakes for you? What is listed as “High Stakes” in Hold’em has changed over the years. Players are way better these days, and the weaker players aren’t as abundant. As a result a lot of players have had to go down in stakes and the big games don’t run near as often. In the height of NL Hold’em, I was playing 100-200NL, now I’m playing 10-20-40NL. 10) When such large amounts of money are at stake, do you ever get nervous? No matter the stakes, I’m always nervous/ excited when I first sit down. The adrenaline get’s pumping and it’s a lot of fun. After a pot, I relax and sink into my contort zone, and just play cards. It’s a few hours after I’ve cashed out that I sometimes realize the amount of money I had on the line. 11) Which professional poker players have you played with, and have you managed to beat any of them? Poker is such a small community. I don’t think there are many players I haven’t played against. Part of poker is beyond our control, so yes I’ve beaten many great players and vice versa. 12) Does the fact that you’re a woman give you an advantage, or a disadvantage, at the table? There are advantages and disadvantages to being a woman at the table. The important thing is understanding how your physical image affects your poker image. Last year I was in a pot where I five bet 67s from the Button and the SB laid down QQ (this is Cash). After he laid his hand down, he said “I’ve never been 5-bet by a women before.” In this spot being a women, helped my image to have a hand as strong as queens lay down. 13) Do you think that female players have a realistic chance of capturing seats at the WSOP Main Event final table? Of course. The disadvantage women have in WSOP is there aren’t as many of them, and Poker nights, at least in North America, are generally a boys’ thing, so less women are exposed to Poker. Our genetic differences have nothing to with the reason it’s been so long since a women has been at the final table. 14) You’re from Canada. Is playing poker legal in Canada? Is online poker legal in Canada? Online poker is legal in Canada. In fact, in my province we have a government run gaming site. Other sites that are not government run, are less legal, and remain a grey area. 15) What are the prospects for poker in Canada? There’s a lot of growth potential for both live and online poker in Canada, the major casinos in the big cities don't give it enough respect as they make so much more from Baccarat, slots etc. but will likely realize as they cut down there poker rooms, they are also losing a major attraction that brings in a lot of regular players. 16) You served as a host for the Canadian Poker Tour. What does this job entail? 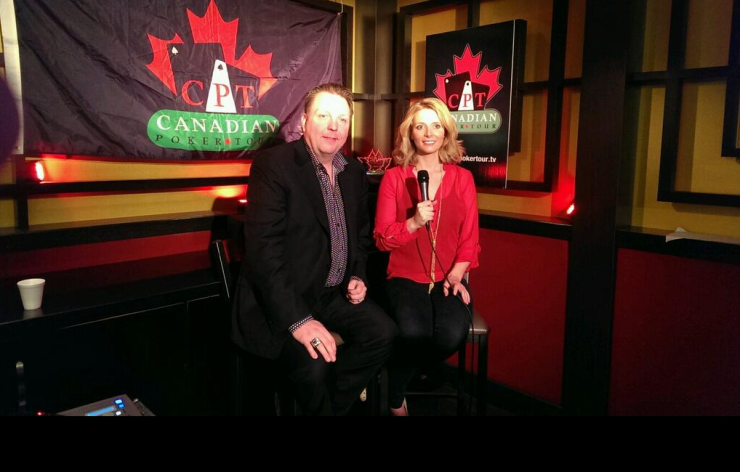 Last year I was invited to host the Canadian Poker Tour. I invited my poker playing friends from all over, promoted the event, and did on air updates on the event. I was invited to host the next major CPT event a few months later, but I declined. 17) You’ve traveled to Australia to play the Aussie Millions. How did that go? I have been spending a lot of time in Australia the last few years, for Aussie Millions as well as WSOP-AP. I love Australia. Melbourne is a beautiful and friendly city and the Crown (although very expensive) hosts a great event. 18) Where else has poker taken you? The biggest advantage of being a poker player is the ability to travel the world. I’ve been to almost every continent for poker, with some of my favorite destinations being Dominican Republic, Macao, Monaco, and Chicago. 19) What are your poker plans for 2015? I plan on attending the WSOP here in Vegas, and focus mainly on Cash, and also attend WSOP-E in Berlin this year. Other than that, I’m not making any plans, and will up and leave, at any given moment, if I hear of any great game I need to be part of. 20) What advice can you give to new poker players? If your starting poker now, you’re entering in a time when there are so many great resources to learn from. If you want to improve quickly, use these resources, watch videos, participate in Twitch sessions, and tweet questions to your favorite pros. Images are from gillianepp.com and Gillian Epp's Twitter feed and used with permission.